I love chocolate, and I’m so satisfied when I can enjoy my cacao nut balls without worrying about the additional sugars and fats. And I can’t stop eating them. 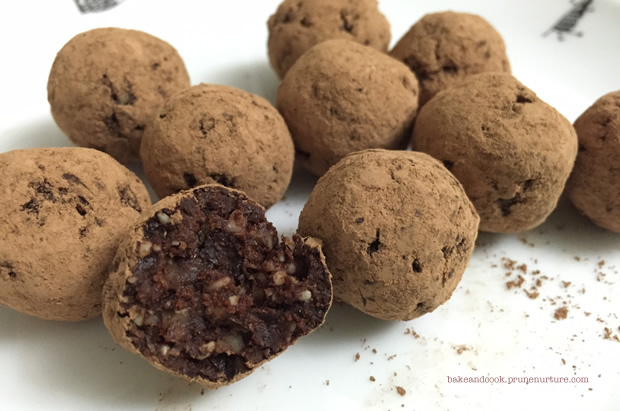 Cacao nut balls are so easy to make. Anyone with a blender or food processor can make them easily. Cacao powder is the least processed form and it’s packed with antioxidant, minerals and vitamins. Eating cacao keeps us happy, protect our hearts, lower blood pressure and also prevent premature aging. I also eat cacao powder with my oatmeal, homemade ice-cream and smoothie. Use hands to roll the mixture into bite-size balls. Place the cacao nut balls into a container and put them in a fridge for at least 30 minutes to chill. Coat the balls by rolling them in the raw cacao powder, and they are ready to be served. Store them in an air-tight container in the refrigerator.